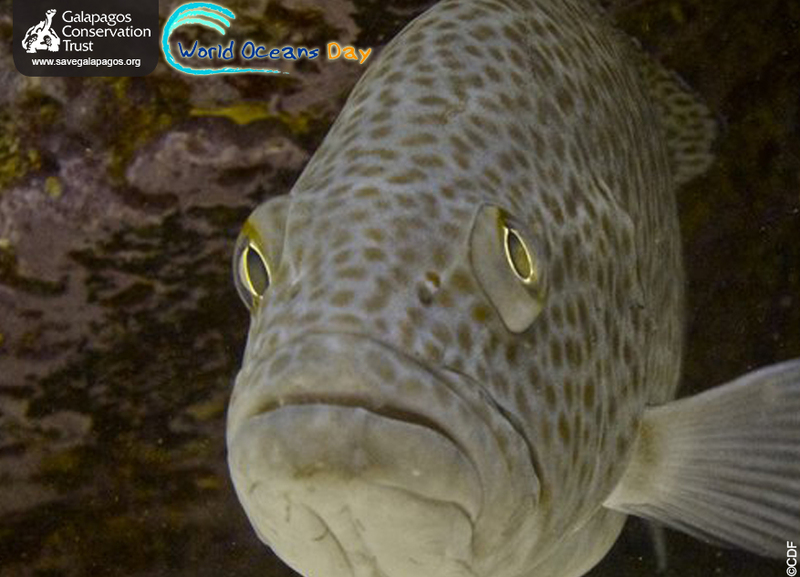 The Bacalao grouper is the local name for this large whitefish which is common in the waters around Galapagos. Some more common names for this fish are Colorado grouper, mangrove grouper, sailfin grouper, sea bass and yellow grouper. Its Spanish name is bacalao. The bacalao is common around the Galapagos Islands but listed as vulnerable on the IUCN Red List due to its restricted range as it can only be found in three island groups: the Galapagos Islands (Ecuador), Cocos Island (Costa Rica) and Malpelo (Colombia). This fish has historically been overfished as it was considered the most valuable in the Galapagos Islands. Adult bacalao tend to inhabit rocky structures such as underwater lava ridges and rocky reefs, however juveniles tend to be found in shallower waters or mangrove lagoons. Bacalao have an annual reproduction cycle which peaks in October and December. As with many reef fish, bacalao are hermaphroditic. All are born as females and reach sexual maturity at four years. At around 12 years of age and given the right conditions, they then transform into males. Where to see them: Around the shores of the central and south-eastern islands. A curious species which is known to approach divers and snorkelers, most abundant between 15–40 metres depth. Threats: The restricted range of bacalao makes it particularly vulnerable to any threat, including marine plastic pollution. As the most economically important fish in Galapagos they have been put under great stress by overfishing. Conservation action: Currently there are no conservation schemes in place, however there are proposals to add the species to the fishing calendar to protect them during breeding seasons. A minimum and maximum catch size has also been discussed to be introduced to ensure all fish have the chance to reproduce at least once and there is a sufficient number of individuals becoming males. Currently, we are working with partners to reduce marine plastic pollution in the Galapagos Marine Reserve as part of our Plastic Pollution Free Galapagos programme. Help us to protect vulnerable Galapagos species by donating today! White fish are those which are edible and caught for human consumption, their monitoring is crucial to ensure populations don't crash.